In a very positive development, Union Textile Minister Smriti Irani has agreed to sanction a Composite Textile Park for Arunachal Pradesh. This composite textile park will have facilities for skill development, design and product upgradation and facilities for export of finished handicrafts. For this the minister assured to immediately depute a group of experts to handhold the state government in preparation of the DPR and running the centre there after. 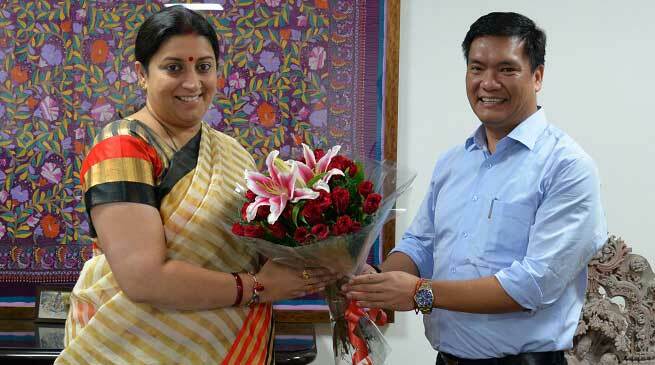 CM Pema Khandu had called on the Union Minister at her Udyog Bhawan office today. On the request of CM to assist the state government in exploring the usage of geo-textiles to mitigate and prevent frequent landslides on the slopes of state and national highways, Irani requested the state government to get the vulnerability mapping done and submit a proposal which shall be sanctioned at a highly subsidised cost. CM was accompanied by Deputy Chief Minister Chowna Mein, Chief Secretary, Principal Secretary and Finance Commissioner during the meeting.